Steve Spurrier Jr. brings a well-known name and a lot of coaching experience to his new job as WSU's outside receivers coach. He reunites with coach Mike Leach as the two coached together in 1999. PULLMAN — So, what is it like growing up as the son of Steve Spurrier? And if Spurrier wasn’t the biggest coaching hire made by the Cougars in the offseason, he was certainly the one with the most recognizable name. Father Steve, of course, is “The Head Ball Coach,” who won the Heisman Trophy as a quarterback for Florida in 1966 and turned that program into a national power as its coach. Steve Sr. also coached in the NFL with Washington (2002-03) before going back to college, coaching for 11 seasons at South Carolina (2005-15). 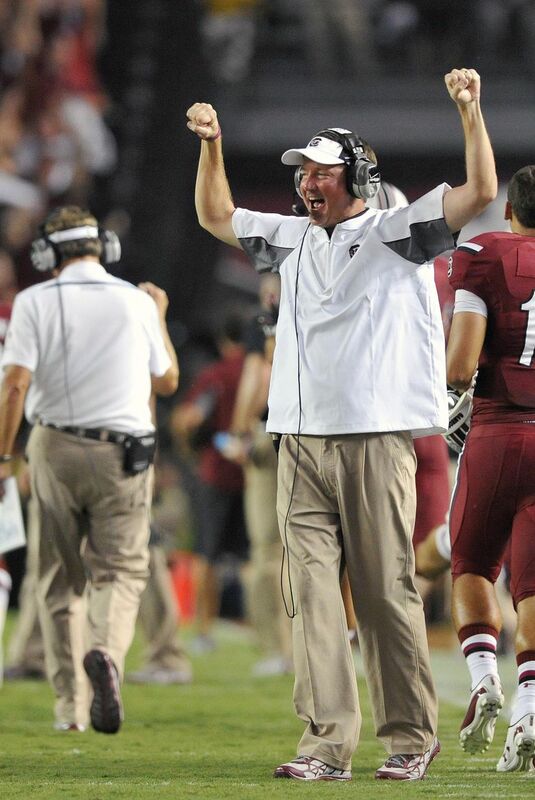 One of his top assistants during his 11 years with the Gamecocks was Steve Jr., who became co-offensive coordinator in 2012. Steve Jr. walked on as a receiver at Duke, and eventually earned a scholarship, “playing quite a bit his last two years” in 1992-93. But alas, coaching and not playing would be his future, and like most young assistants, he moved around a bit as better jobs developed. In 1999, when Spurrier was receivers coach with Oklahoma, he worked under current Washington State coach Mike Leach, who had been hired as the Sooners’ offensive coordinator. Leach left Oklahoma after one season, but he and Spurrier kept in touch. 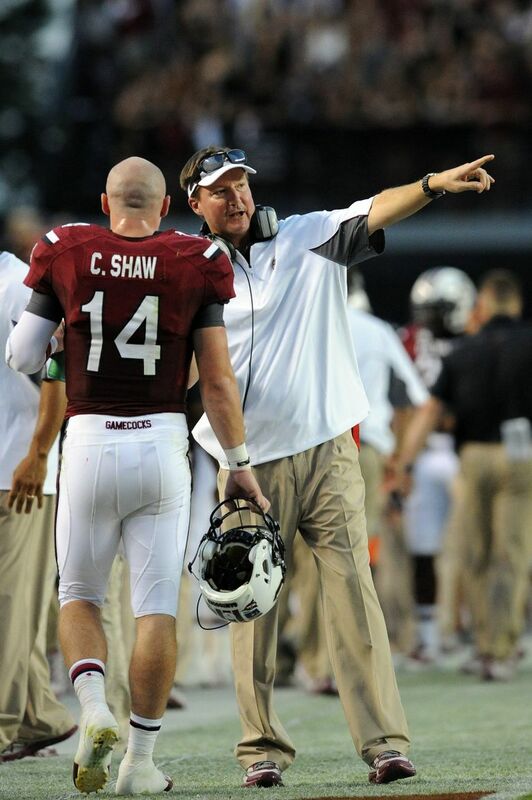 Spurrier Jr. left South Carolina after the 2015 season when his dad quit, then worked for a season with Oklahoma before being the quarterbacks coach and assistant head coach for Western Kentucky last season. 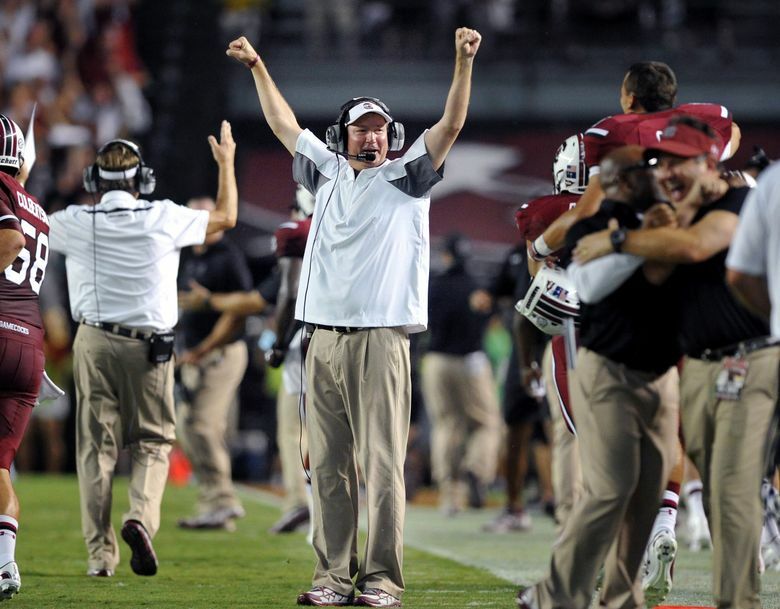 When head coach Mike Sanford took over coaching the quarterbacks this season, something Spurrier endorsed, it gave Spurrier a chance to reunite with Leach. The only downside is not being with his family. After moving the previous couple of years, Spurrier’s wife, Melissa, and their seven children stayed in Bowling Green. There are triplets and twins among the seven kids. The youngest is a “precious” 2-year-old daughter. Spurrier joked, though, about what could have been. The triplets, the oldest, are seniors at South Warren High School in Bowling Green, Ky. Gavin is a successful quarterback on the football team, and is considering trying to walk on at Duke, just as his father did. Luke is a star track athlete, specializing in the 800- and 1,600-meter runs, and Emmaline is a cheerleader. All three are excellent students. Being away from the family will be tough for Spurrier. Spurrier also speaks with his father at least once a week, and he was “fired up” that his son landed at Washington State. Spurrier Jr. likes being in Pullman, but he said the thing that will determine how his experience is will be how the team does.